In 1997, it was demonstrated that quantum states can be teleported from one location to a distant one. The discovery had huge consequences for the development of quantum communication and computing. Nicolas Gisin is in the Group of Applied Physics, University of Geneva, CH-1211 Geneva 4, Switzerland. Who has never dreamed of undergoing teleportation? Especially when stuck in a traffic jam. To get disembodied here and reconstituted at a distant location sounds both marvellous and impossible. But is it really impossible? True, a body made out of matter cannot merely disappear here and reappear there without travelling the intervening distance. But an object is not just matter, it is also structure — substance and form, as Aristotle taught us long ago; particles and quantum states, as physicists would say today. Twenty years ago, Boschi et al.1 and Bouwmeester et al.2 used this idea to perform the first quantum-teleportation experiments, which led to major advances in quantum-information science. In 1993, a group of theoretical physicists3 were discussing two subjects that were highly discredited at the time: entanglement and non-locality. Entanglement is a phenomenon in which two or more quantum particles share a common state, such that each particle cannot be described independently. Non-locality refers to the observation that spatially separated quantum particles behave in ways that defy our intuition about space and time. Suddenly, the theorists realized that a pair of entangled particles could be used to teleport a quantum state from one location to a distant one, even if the sender does not know the quantum state or the location of the receiver (Fig. 1). During the teleportation process, matter at the sender’s location would lose its structure, and unstructured matter at the receiver’s location would acquire this structure. The quantum state would therefore disappear from the sender and reappear at the receiver. Note that this process does not create a copy of the quantum state because the state at the sender is destroyed — as required by a principle known as the quantum no-cloning theorem4,5. Figure 1 | Quantum teleportation. Twenty years ago, Boschi et al.1 and Bouwmeester et al.2 showed that the quantum state of a photon can be teleported from a sender to a distant receiver. The technique uses a pair of photons that are entangled, which means that their properties are strongly correlated. One of the entangled photons (blue) is given to the receiver — in principle, in advance of the quantum-teleportation process. 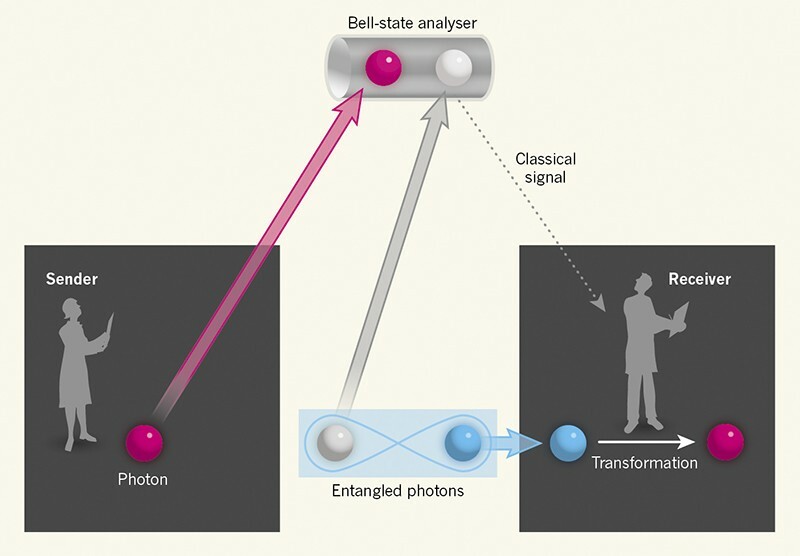 The sender then prepares a photon in an unknown quantum state (pink) and combines this photon with the second entangled photon (grey) in a device called a Bell-state analyser. This device performs a joint measurement of the quantum states of the two photons and sends the result to the receiver as a classical (non-quantum) signal. Finally, the receiver uses this information to transform their photon, recreating the quantum state of sender’s photon. In addition to the two entangled particles, the teleportation process would require a tiny amount of classical (non-quantum) information to be broadcast by the sender. In the usual case of a quantum state that is parameterized by two ordinary (real) numbers, only two bits would be needed — much less information than the classical description of the quantum state. This classical information would guarantee that the entire process does not go faster than the speed of light. The theorists coined the term quantum teleportation, and journalists spread the word around the globe. I think that the term is not only excellent PR, but also faithfully describes what happens: an object disappears in the sense that it turns into unstructured ‘dust’, and distant ‘dust’ acquires the exact (and possibly unknown) structure of the object. Fully understanding quantum teleportation is tricky6, and the concept initially led to some confusion. For example, I was once invited to a conference on how to mitigate traffic jams. However, quantum-information scientists quickly understood the concept and the challenge of demonstrating quantum teleportation in an experiment. The main challenge that needed to be overcome was the realization of a Bell-state measurement. This refers to a joint measurement of two quantum states: the state to be teleported and the state of one of the entangled particles. The goal is to acquire information about the relationship between the two states, without gaining any information about the states themselves — analogous to measuring the angle between two touching arrows, without learning anything about the directions in which these arrows point. This is possible only in the quantum world, exploiting another aspect of entanglement6. Today, we know that it is impossible to perform a complete Bell-state measurement using only linear optics7 (for which the intensity of light is not high enough for photon creation to occur). Two groups achieved the feat of quantum teleportation in 1997 — just four years after the theoretical breakthrough. First, it was the team of Boschi et al. based in Italy, followed only a few months later by the team of Bouwmeester et al. in Austria. Sandu Popescu, a member of the Italy-based team, had the idea of encoding the two quantum states involved in the Bell-state measurement in a single photon1. Harald Weinfurter, a member of the Austrian team, discovered how to perform a (partial) Bell-state measurement on two independent photons8. Although Boschi et al. were the first to demonstrate quantum teleportation, the refereeing lottery meant that the work of Bouwmeester et al. was published first. This could have triggered a fierce battle, devastating the nascent quantum-information community. Fortunately, there was enough work and creativity to keep everyone busy. The same year, a group of scientists met in Finland and launched European projects dedicated to quantum-information science. I was there and could therefore contribute, together with several colleagues, to these highly successful projects. The work led to today’s quantum technologies flagship9, which is the largest scientific programme in Europe. Since 1997, quantum teleportation has become a major part of quantum-information science. For instance, it was realized that the process could enable quantum communication over arbitrarily large distances, thanks to devices called quantum repeaters10, or communication in space. Earlier this year, quantum teleportation was demonstrated between a satellite and a ground station in China11, over distances of up to 1,400 kilometres. In quantum teleportation, there are three key distances: from the sender to the Bell-state analyser (the device that performs the Bell-state measurement), from the entangled-photon source to the Bell-state analyser, and from the entangled-photon source to the receiver. Most experiments have tried to maximize the last of these distances because this is the easiest to achieve — although one experiment considered all three distances12. Other work has suggested exploiting teleportation over extremely short distances (a few millimetres), but using a huge number of quantum states13. This could tremendously speed up information processing in quantum computers compared with what would otherwise be possible. Twenty years on from its first experimental demonstrations, quantum teleportation is a tool that will allow the highly successful community of physicists, engineers, computer scientists and mathematicians to work together to develop the next generation of quantum-communication systems and quantum computers. Boschi, D., Branca, S., De Martini, F., Hardy, L. & Popescu, S. Phys. Rev. Lett. 80, 1121–1125 (1998). Bouwmeester, D. et al. Nature 390, 575–579 (1997). Bennett, C. H. et al. Phys. Rev. Lett. 70, 1895–1899 (1993). Wootters, W. K. & Zurek, W. H. Nature 299, 802–803 (1982). Dieks, D. Phys. Lett. A 92, 271–272 (1982). Gisin, N. Quantum Chance, Nonlocality, Teleportation and Other Quantum Marvels (Springer, 2014). Lütkenhaus, N., Calsamiglia, J. & Suominen, K.-A. Phys. Rev. A 59, 3295–3300 (1999). Weinfurter, H. Europhys. Lett. 25, 559–564 (1994). Riedel, M. F., Binosi, D., Thew, R. & Calarco, T. Quantum Sci. Technol. 2, 030501 (2017). Bussières, F. et al. Nature Photon. 8, 775–778 (2014). Ren, J.-G. et al. Nature 549, 70–73 (2017). Landry, O., van Houwelingen, J. A. W., Beveratos, A., Zbinden, H. & Gisin, N. J. Opt. Soc. Am. B 24, 398–403 (2007). Steffen, L. et al. Nature 500, 319–322 (2013).